King Koopa's Kool Kartoons is a live-action children's television show created by DIC Entertainment as a spin-off of their previous show, The Super Mario Bros. Super Show!. The format of the series is comparable to Bozo the Clown's television show. King Koopa hosted the show and was originally played by Christopher Collins (later Patrick Pinney) inside of a rubber suit as the show's emcee. Koopa's appearance and demeanor was based off his role in The Super Mario Bros. Super Show!! The King Koopa appearance was changed for the cartoon to be more believable for a live action show. At the end of the show King Koopa gave away prizes such as the Power Glove. The show's run began during the 1989/1990 holiday season. Each episode of King Koopa's Kool Kartoons lasted for thirty minutes and aired during the after-school afternoon time slot. KTTV Fox 11 broadcasted the show to the Southern California region alone, possibly to gauge the title's popularity before expanding. However, the production of the series ended after its first season. Later, the show was broadcast for English audiences through The Children's Channel. Like The Super Mario Bros. Super Show before it, Kool Kartoons followed a set format for each episode. 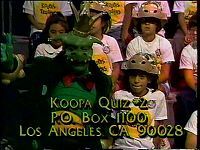 After the pre-recorded introduction, the show transitioned to the show's set, where King Koopa began hosting in front of a live audience of children called King Koopa's Troopas. The show's tech crew are dressed similarly to the Troopas when they appear. The pre-recorded introduction featured King Koopa, Ratso, his Rat terrier, and his Troopas strutting down a Los Angeles steet towards a television studio. The king and his minions sang the theme song (see below). As they pass a crowd of stunned people, one of the older Troopas puts a Koopa mask on a child in the crowd who proceeds to follow them. When they arrived at the doorway a bewildered guard attempted to block their entry, Koopa pulls the whistle from his mouth. Entering the set of a clown's studio as an episode of his show is filming, Koopa and his children proceeded to take over the show. Bowser pushed the cameraman away and proceeded to confront the clown, who panicked. After the clown attempted to win Koopa's favor through roses and a balloon, Koopa pops the balloon with his claw, scaring him away. The previous audience having left, King Koopa's Troopas are free to fill in the seats. Koopa glares at the screen as he screams, "It's my show now!" The screen turns black as he points his scepter at the screen and cries, "BAH!" Words in parentheses are sung by King Koopa's Troopas. The words outside of the parenthesis are sung by Koopa. Who calls you a nincompoopa? And knocks you for a loopa. I've got the show you'd better watch. King Koopa (screamed): It's my show now! BAH! At this point, the show focused on the studio, where Koopa sat behind a desk in front of his audience of Troopas. Behind the host was a piece of a wall upon which hung pictures of Mario, Luigi, and Princess Toadstool as they appeared in the animated segments of The Super Mario Bros. Super Show! As the show’s emcee, he would read fan mail and host quizzes. These quizzes were open to any child viewer, as responses were sent into the show via the mail. Throughout each episode, King Koopa would play cartoons from the 1920s and 1930s which were in the public domain. The cartoons had absolutely no relation to the Mario franchise, and did not even share any of its major themes, such as that of a hero rescuing a princess or damsel from a dragon-like or monstrous creature. At the end of the half hour, the credits would appear in front of another prerecorded segment. King Koopa starting a quiz. This page was last edited on March 22, 2019, at 12:25.